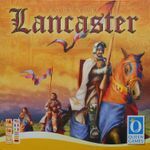 Another worker placement game where your workers are knights. The catch being that stronger / higher ranked knights can kick out the lower ranked ones and take their place. Quite vicious as worker placement games go. Everything present and accounted for and in great condition bar some minor box wear.